Tarot is thought to have originated in India and was brought to Medieval Europe by the gypsies in the 9th century. They brought their Hindu religious beliefs and customs with them, and one of these customs involved the keeping of religious texts on cards bound together by string. These sacred cards were highly decorated with illustrations and symbols designed to explain the basic elements of the faith. This is where the tarot deck emerged from in the 14th century. The cards of the Major Arcana represent the major issues of life and the Minor Arcana represent the more mundane aspects of life, and people. 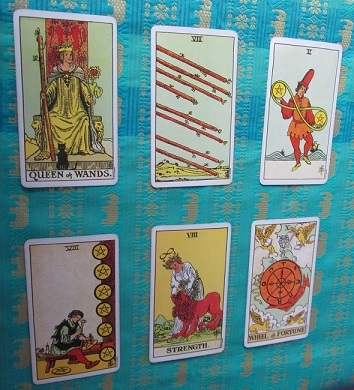 Working from my salon in Pokesdown I use the tarot to give advice and guidance. They can give answers to a particular problem or they can provide insights in all aspects of your life. I also do Tarot Reading Parties - invite a few people to your home - no more than 5 - and I will come and do readings for you all. As the hostess you will receive your reading for just £5. I charge £20 for a full reading which can take anything from 20 minutes to an hour, depending on what the cards bring up. £5 for a 6 card mini reading which takes approx 10 minutes.